Recently Ron Lambert gifted a stack of B&W 35mm Titian Paramountware negatives to Te Toi Uku / Portage Ceramics Trust. Cameron Brown gave these negatives to Gail Lambert while she was writing her book. 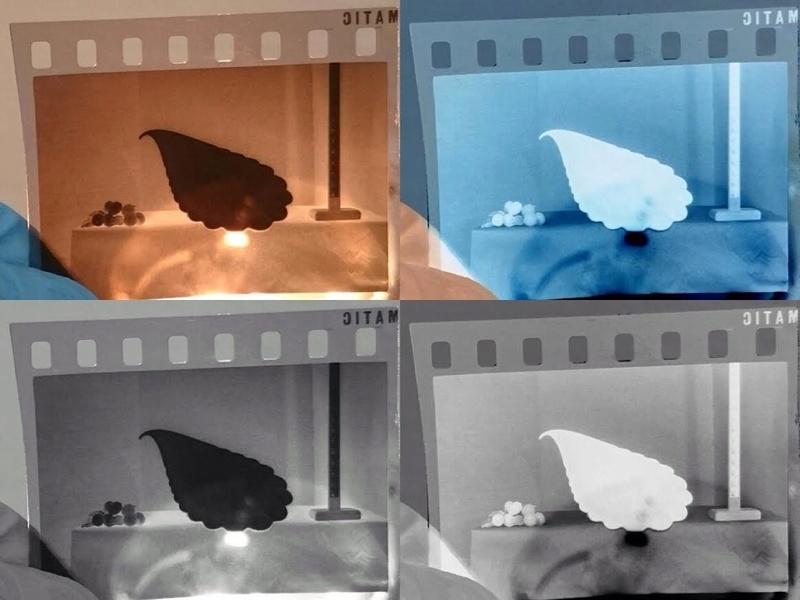 In Cam's letter he said that the negatives here contain about 50% of the Paramount range produced in the 1960s. 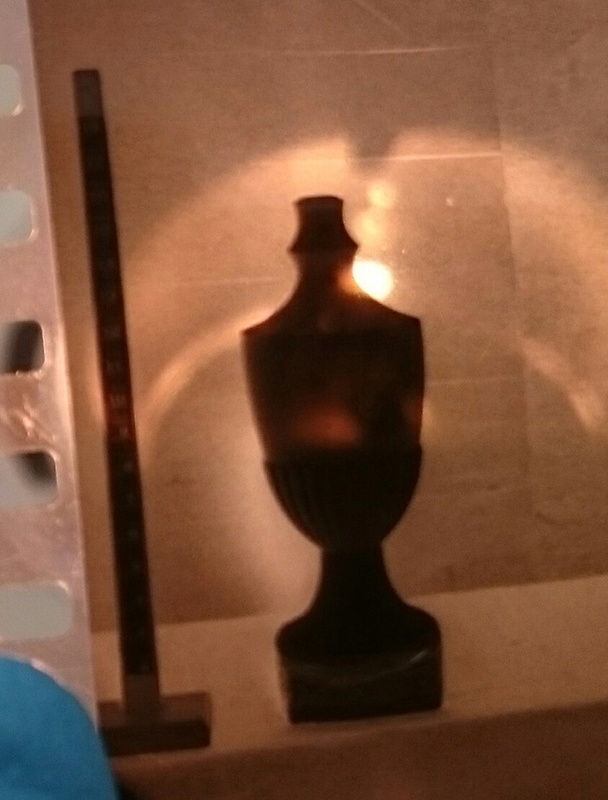 The plan is that the negatives will be scanned some time in the future - but until then here is a list of the negatives, for anyone who wants to come in and do further research on Paramountware and Titian. Thank you so much as that was a big effort transposing that lot !! Next time I visit the Museum I will have to check these out if possible. There are 40 shape numbers that we don't have in the Titian Gallery and we may have the shape but not the number and I will have to check the negatives to make sure. We already have 35 of those shapes in the Titian Gallery, but we have a lot more to find. Out the 12 Lampbases we only have one that haselnuss posted and I will hopefully find a number for it. Though I did find at the end that I had more photos than numbers, due to being distracted by wonderfully interesting people. It will take time to share all of the info, but I will do what I can when I can. I don't have permission to post pics of the negs and as the photos are terrible I won't be asking for permission. 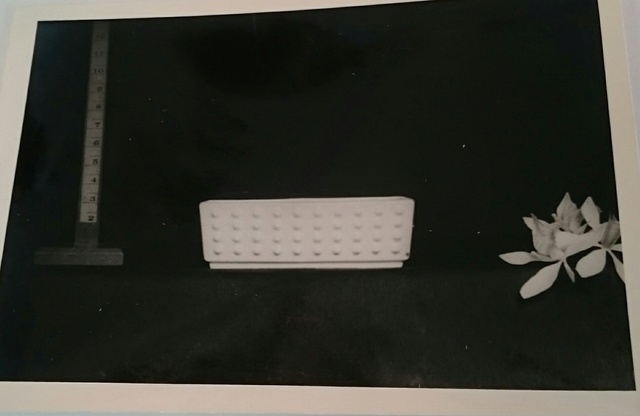 The ware in the negatives looks very much like that in the photo of Gail Henry's book taken between 1966 and 1969 on page 158 in her 2nd Edition. For my own delight, I posed some of these Titian lamps in a mock up of an interior the like of which they were designed for. 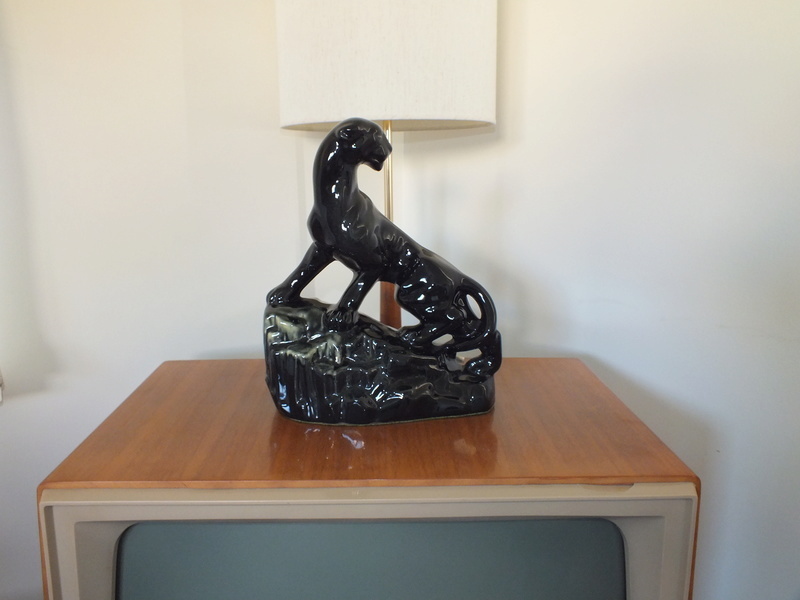 The Titian panther T.V lamp is an interesting and actually unique object in New Zealand commercial ceramics. It is, to my knowledge, the only T.V lamp produced here. The reason for this is that television arrived in New Zealand rather late (1960). 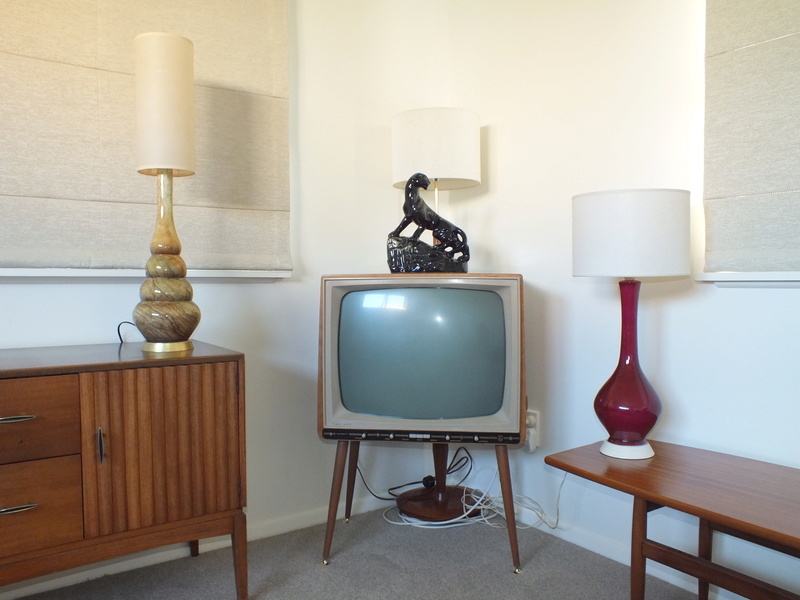 T.V lamps are really a North American and European artifact of the decade of the 1950s. This was due to the rather primitive tube display technology of that decade, which required the assistance of backlighting as a foil for the light-emitting screen to facilitate ease of viewing. 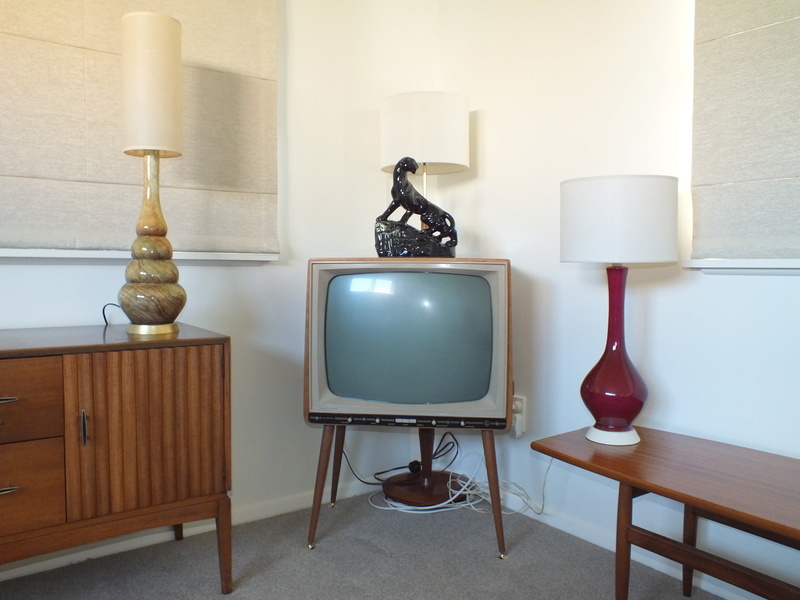 By 1960, technology had moved on and the first generation of televisions available in this country did not appear to demand the services of a prowling cat or cavorting nymph concealing a discrete lamp to project the grey-scale spartan interior of the NZBC newsroom into stylish mid-century living rooms. The television depicted here is an early 1960s model made in the Philips factory in Wellington. It has a blond wood molded ply carapace and Jetson's-style pin legs - exactly the type of television on which this Titian lamp would have been placed sometime between 1960 and 1963. The two lamps on either side are the two tallest shown lined up along the front of the Titian photo on page 158 of Gail Henry's second edition. The one on the left may be considered the most mythic creature by many Titian collectors - the large "Hubble-Bubble Lamp". This is the only one I have ever seen, and what a masterpiece of elegant design it is - a quadruple gourd form that measures 485 mm to the bottom of the light fitting. It must have demanded the patience of Job to produce with its long gracile neck. 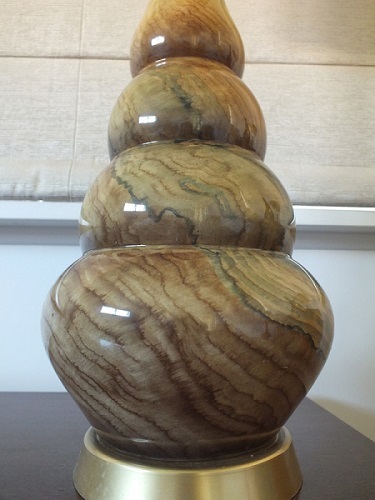 The glaze is a hand-painted Teddy Rennie wood grain special, which is neither the usual mahogany nor the oak grain. I have not seen another quadruple gourd form mid-century lamp from anywhere else in the world. The lamp on the right is the second tallest in the line-up and also a gem of elegant design in what we believe to be the rare Titian "Ox-blood" glaze. The point I would like to make here is that these Titian lamps employed the most tricky production techniques and the very best glazes available to Cameron Brown and his team. They would likely have been expensive articles in New Zealand department stores in the 1960s and compare favorably with the best contemporary lighting/lamp design available in Europe and America. Unfortunately these lamps are rare. Rare is an overused word, but is probably correct here. Ev - How do I right my hubble-bubble pictures? Oh My that is a fantastic Titian post T&C and it takes my breath away. It made my heart go pitter patter as it did when I saw the negatives. I think that the large wonderful bubble lamp base is the P.L.12 Shape, but will have to confirm. The Cougar Lamp Base is P.L.7 and the Ox Blood lamp base is there, but I need to check the number. I tried to fix the hubble bubble photos, but it wouldn't let me. My only thoughts are that they are a bit too big for the site. Perhaps if you reduce the size and post them again they will work. Rare as rare as hen's teeth and unicorn horns they are !!!!! I've reduced your Bubble Lamp photos T&C and will post them up the right way for you. I will add your photo to the Titian Gallery too thank you. 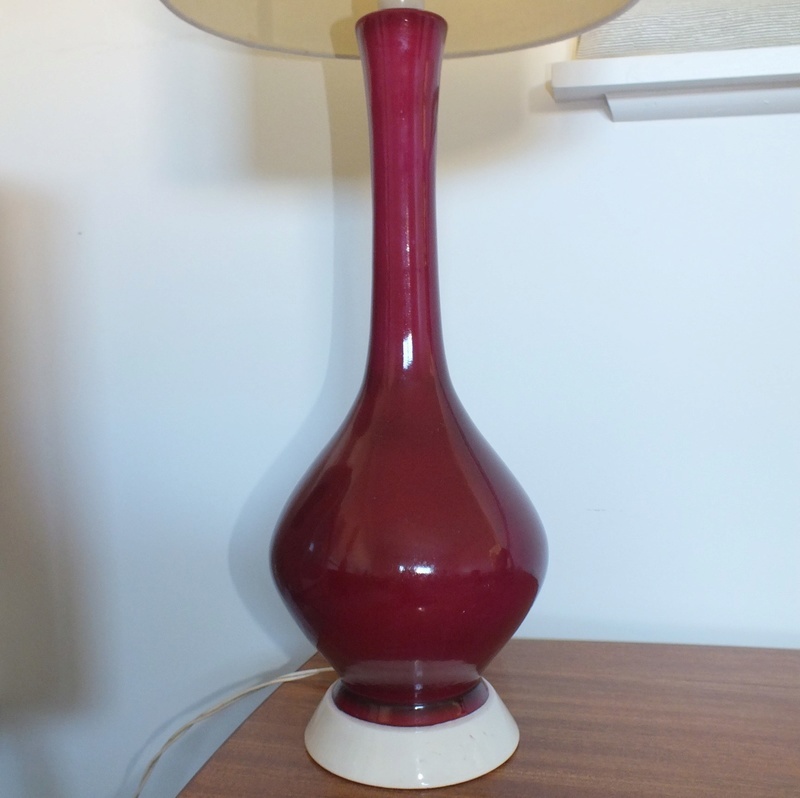 The beautiful Ox Blood Lamp Base is P.L.11. Well that is the Paramount number. I'm back at the Museum trying to sort out these shapes. Have you a negative of the lamp base with the hole through it please Ev? 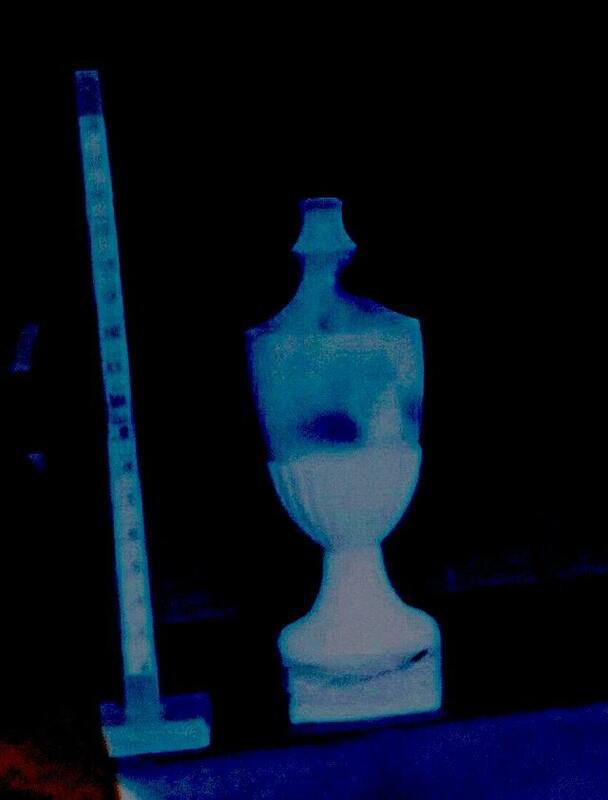 Hi dollcrown, I'm trying to find out how to turn these negatives into positives so that I can see them properly. I will let you know if I see the one with a hole through it. The Bubble Lamp is shape P.L.13 teaandcoffee. Ev, I use an app called PixlrExpress+ (among others) for manipulating images on the iPad. One of the effects is to change from negative to positive and vice versa. 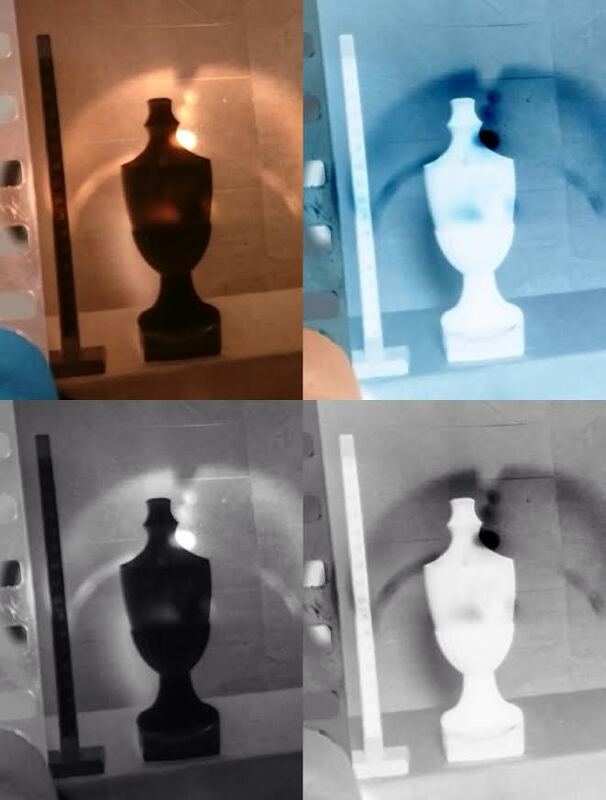 Here's an example of the effect using a picture I have just posted today. This works with both black and white and colour. There must be plenty of free apps that do the same. ... but a completely different one for adding the splashes of colour for the eyes and mouth. Thanks so much Jeremy, I will give it a go. Thanks for that information Ev. It is interesting that both the tall lamps are at the tail end of the range (P11 and P13). I imagine this means they are likely to be mid to late 1960s ones, whereas the genesis of the others will range from late 50s to early-mid 1960s. 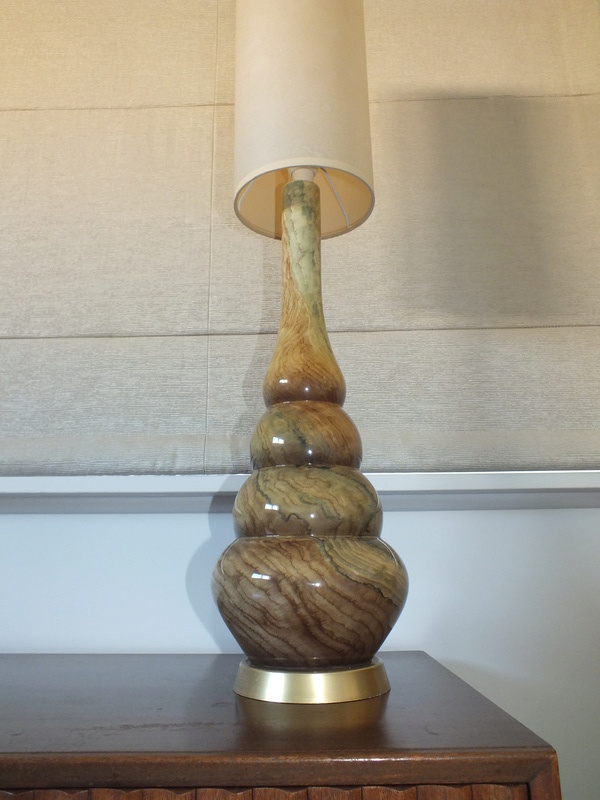 The panther/cougar lamp is a case-in-point. I believe it should date pretty much to the year of the introduction of TV in New Zealand (1960). Much later and it would have been obsolete on arrival. It would settle a wee question in my mind to know if the photo in the book was taken in 1966 or further towards 1969. 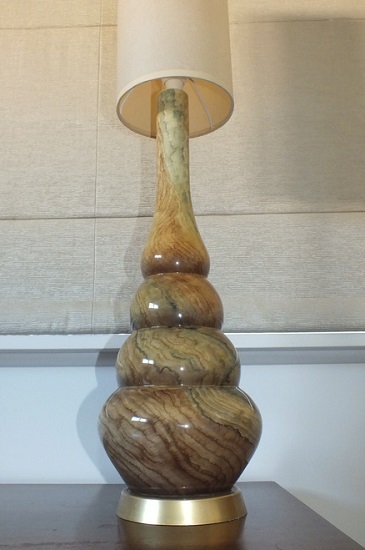 In my opinion, form-wise, these later numbered lamps are the most attractively designed ones. What shape was P12 incidentally? Was it the small hubble-bubble lamp by any chance? Val - the glaze looks a bit more maroon in the photos than it is in reality. This must be due to the camera flash I think. 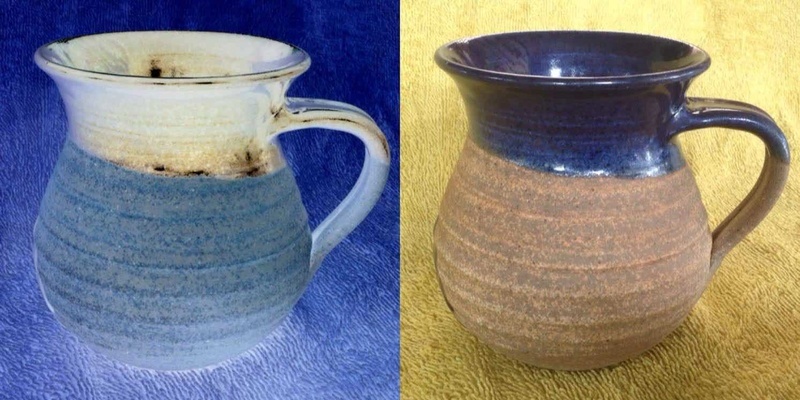 The glaze is quite different from the usual Titian maroon glaze. This one has a bit more vermilion/scarlet in it. 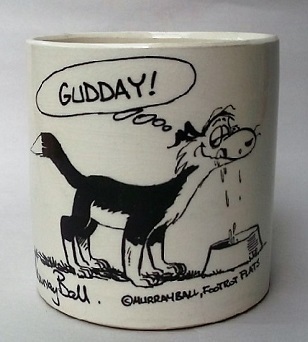 There is a record of an 'ox-blood' glaze developed by Cam Brown so it made sense to us to conclude that this is it. We haven't seen another example though. Jeremy could you please convert a couple of negatives for me, I haven't had any luck yet. P.L.12 Lamp Base for teaandcoffee. There is no small bubble lamp base between P.L.2 and P.L.13. Ev, the negative conversions of your images looked wrong so I tried them in black and white too. I'm not sure what is going on. That one just appears to be a b&w photo. 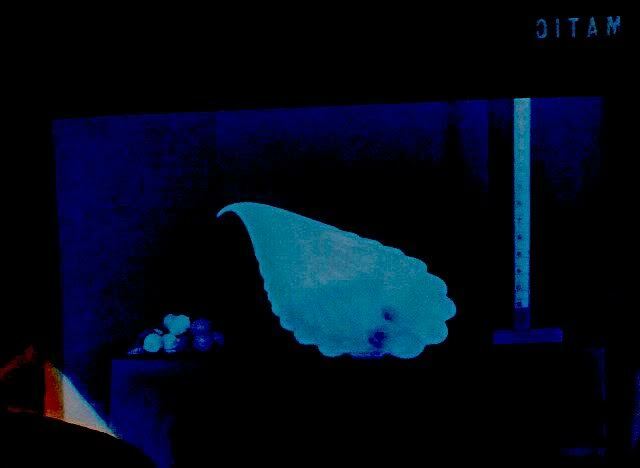 Was the flaring in the previous two photos contained on the film or did you pick them up in re-photographing? 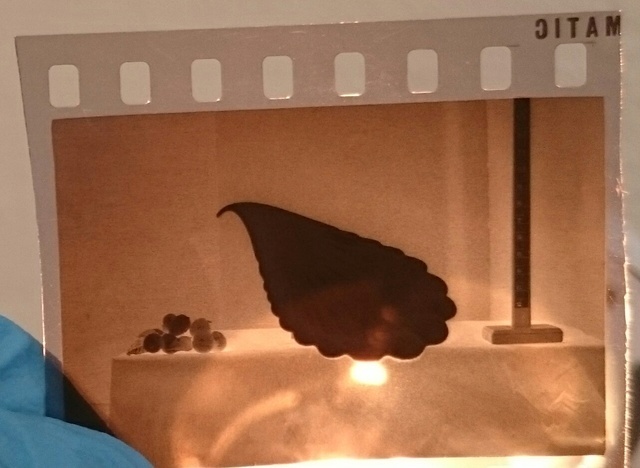 As I said above, I had to hold the tiny negatives up to a lamp light as I didn't have a light-box to photograph them. It is mainly to see the shapes and I've managed to do this, though details are dismal. T&C I found in Gail Henry page 168 that the Clock surrounds were made circa 1960 and there is a negative with 3 China Clock Cases in this lot. Ev, I've reduced the brightness to give you a bit more detail. You can see the numbers on the rule in these so the brightness is about right. I didn't address other issues. Wow thanks Jeremy as details pop out on both of them now. Sorry teaandcoffee, have let some nice lamp bases slip through my fingers, but still have my two favourites, the doughnut style one has the gold stardust on it which gives it a lovely sheen. 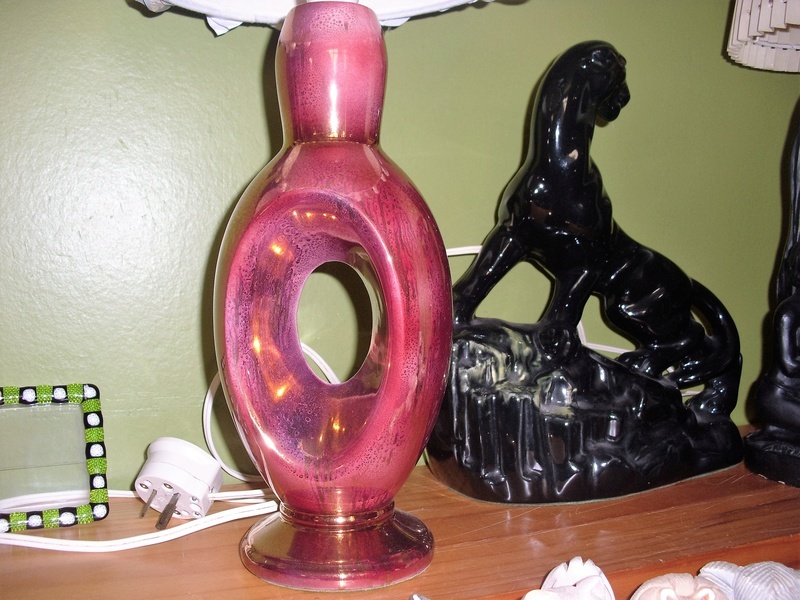 Dollcrown - very nice lamp and nice to see in that dark pink acid lustre star-dust glaze which is also a rare one. The usual star-dust is the gold on black found on vases, but I have seen several lamps now with unusual star-dust colour combinations.